» home » magazine » 2013 » may 2013 » how high is high for automotive steels? Ronald Krupitzer is vice president, automotive market, for the Steel Market Development Institute: www.autosteel.org. Photo courtesy of Severstal North America. It was quite surprising the other day when an engineer mentioned to me that he was studying the use of an 1800-MPa tensile-strength steel for a part. Back in the 1970s when automotive steels were primarily mild steel with yield strengths of 170 MPa and tensile strengths of 275 MPa, that was all the strength required to make a car or light truck. The properties of greatest interest to the car makers were formability indices like r-value, which determine how deep a part can be drawn into a die; the steel’s related uniform elongation, n-value, which determines the amount of stretch a part can handle; delta r, which measures the unevenness of a draw, also known as the earing characteristics; and the forming-limit diagram (FLD). Are we seriously talking about using steel products in automobiles that are more than six times as strong as mild steel? And, if we now can formulate steels six times stronger than mild steels, what’s the limit? For the stamper or the forming specialist, what new factors need to be looked at to handle this amazing shift in strength? The quest for mass reduction in automobiles began in earnest in 1973, when carmakers reacted to the oil crisis and embargo as the United States experienced runa gas pricing and shortages. Then, in 1975 Congress enacted the first Corporate Average Fuel Economy (CAFE) regulations. This first wave of fuel-economy requirements required passenger cars to improve from about 18 miles/gal. to 27.5 miles/gal. during the period of 1978 to 1990. At the same time, dialog between car companies and steelmakers shifted to how the steel industry could contribute. This began a mission that has never stopped. Fig. 1—The NHTSA and IIHS required a large number of crash tests to improve vehicle safety from 1990 to 2010. What level of strength increase of the high-strength steels (HSS) was developed during this first wave of mass-reduction efforts? During the 1970s and ’80s, the industry welcomed two types of HSS: dent-resistant steels, and high-strength low-alloy (HSLA) structural grades, both of which now are classified as conventional HSS. For dent-resistant steels, providing higher yield strength in the part and reducing the outer panel thickness became important objectives. 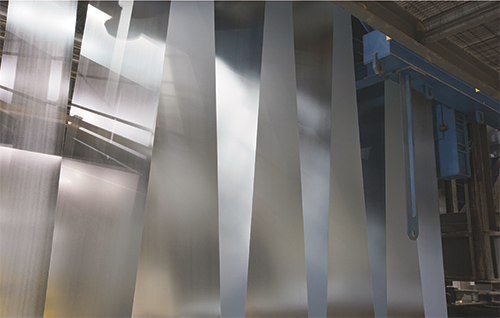 Two types of dent-resistant steels were introduced—renitrogenized sheet steels that had accelerated strain-aging properties at room temperature, and bake-hardening steels (still used today) that also provided strain hardening, but with the majority of the hardening occurring during the baking of the stamped body panels occurring in car-company paint shops. Fig. 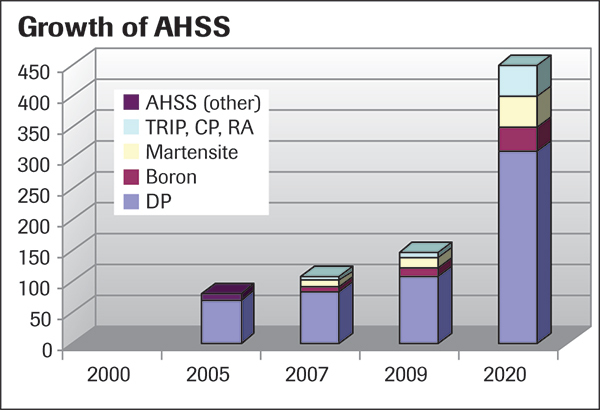 2—AHSS use grew noticeably from 2000 to 2009 (source: Ducker Worldwide). The combination of stamping deformation and aging resulted in steels with higher final yield strength in the body panels. The effect was linear, so if an exterior body panel formed from 170-MPa yield-strength steel could be replaced with a 240-MPa panel, dent resistance would improve by 40 percent. Also, panel thickness could often be reduced by formulas corresponding to the square of the thickness difference and the local panel stiffness. It was not uncommon to achieve reductions of panel thickness of 10 percent using dent-resistant grades. For example, consider a hood evolving from 0.80-mm to 0.72-mm in thickness with equivalent or better dent resistance. The formability of these stronger steels followed the same rules and was adequately predicted by r and n values, uniform elongation and FLD. So, these first steels made their mark with strength increases of 40 percent, a far cry for what we are talking about today. Fig. 3—NHTSA’s call to increase CAFE standards for cars and light trucks by 2025 will continue to fuel the growing use of AHSS. The HSLA steels introduced into the automotive market were classified by yield strength, with the most popular strength levels being 345 or 350 MPa for cold-rolled and galvanized applications, and 550 MPa for hot-rolled parts. These grades were similar in low carbon content and therefore easily spot-weldable, so no changes were necessary to existing welding equipment. The higher strength created growing pains among die designers as they learned new rules to compensate for springback of the strongest HSLA products. Again, the formability of these steels was adequately predicted by r and n values, uniform elongation and modified FLD. However, parameters affecting hole-expansion test performance and edge formability also became important, especially for the 550-MPa hot-rolled grades. Steelmaking processes that controlled or eliminated non-metallic inclusions were introduced to ensure that these forming modes could be successfully undertaken without premature splitting. Fig. 4—With the advent of the FSV project, we’re well on our to use of AHSS grades in excess of 1500-MPA tensile strength. During the 1990s and first decade of the 2000s, North America welcomed new advanced high-strength steels (AHSS) such as dual-phase and TRIP (transformation-induced plasticity) grades. This move was accelerated by the results of the UltraLight Steel Auto-Body Advanced Vehicle Concept (ULSAB-AVC) project, completed in 2002. This multimillion-dollar global engineering study showed that remarkable mass savings were attainable by using HSS and AHSS grades. Simultaneously, from 1990 to 2010 the influence of regulations governing vehicle crashworthiness increased dramatically. The National High Traffic Safety Administration (NHTSA) and the Insurance Institute for High Safety introduced more crash tests during this time than during any other period in history (Fig. 1). 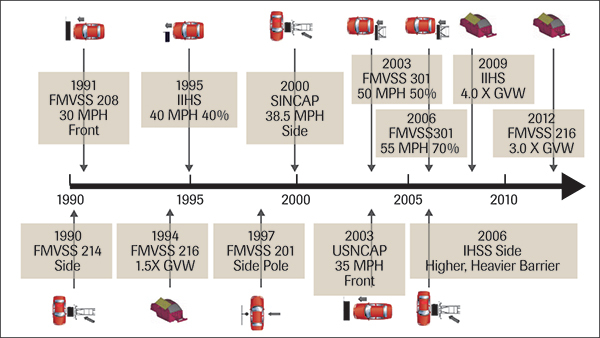 These regulations stimulated, from 2000 to 2010, the rapid adoption of AHSS grades into vehicles (Fig. 2). These materials became the proven choice for passing new crash tests and avoiding excessive weight gain. Steel strength now was able to approach and exceed the 1000-MPa barrier. The processes most commonly used to make steel parts at this strength level included rollforming, hot stamping and, to a limited extent for simple parts, cold stamping. 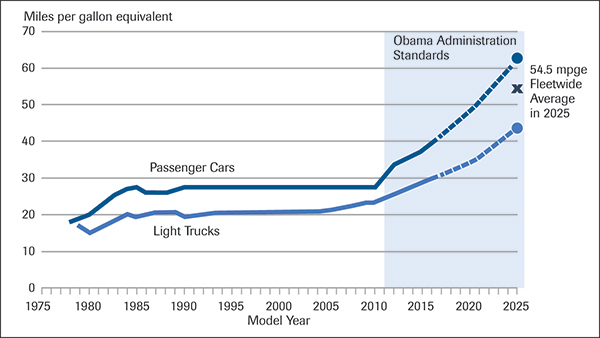 Further need for development of higher-strength steels came from NHTSA and the Environmental Production Agency with the new wave of CAFE fuel-economy regulations, to be implemented from 2012 through 2025 (Fig. 3). Now, in addition to safety, AHSS grades need to contribute to mass reduction so that car companies can improve corporate fleet fuel-economy by about four percent per year until 2025. 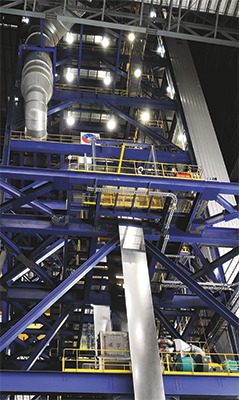 An important global steel industry project, FutureSteelVehicle (FSV), was completed in May 2011 with considerable engineering optimization technology leading to results building on the success of the ULSAB-AVC project. In FSV, optimized steel designs were applied to the latest electrified powertrain vehicles, battery electric vehicles, plug-ins and fuel-cell cars. Every aspect of ULSAB-AVC technology is enhanced in FSV, and there is a noticeable shift to higher tensile-strength steels (Fig. 4). The AHSS grades are considerably stronger and more formable—five different grades of AHSS exceed the 1000-MPa level. Fig. 5—This 2014 Mazda CX-5 bumper assembly features a hot-stamped beam of 1800-MPa steel. Today we see the trend of introducing steel grades with increased tensile strength continuing. For example, an 1800-MPa tensile-strength bumper recently was developed for the Mazda CX-5 bumper (Fig. 5). This represents the highest production tensile-strength automotive part to date. Tensile strengths exceeding 2000 MPa are familiar in parts like aircraft landing gear, but not automobiles. While the processes used to make aircraft parts, such as vacuum arc remelting and forging, are not typical automotive processes, automotive steels are indeed approaching that amazing 2000-MPa threshold. The quest for lighter automotive parts and higher standards for vehicle structure and safety continue to inspire research and development of future steels. The Auto/Steel Partnership (A/SP), composed of several automotive steel producers and automakers, together with five universities, two engineering companies and Pacific Northwest National Labs was recently awarded a $6 million research grant along with the United States Automotive Materials Partnership. The grant will support the study and modeling of the metallurgical characteristics of a new generation of AHSS grades, a third generation that will have high gigapascal strength levels and exceptional formability. The objective is to move high-tensile-strength steels into uncharted territory, so more of them can be cold stamped economically into very lightweight parts. The science that will be employed in this 4-yr. study is called integrated computational materials science. It makes use of the amazing rise in computer-based analysis involving materials models essentially spanning the scales from atomic/nano microstructures all the to assembled vehicle structures. As new metallurgical steel grades are discovered through such research, more studies dealing with formability, fracture and joining of the new steels will certainly follow. The A/SP is studying these enabling technologies.